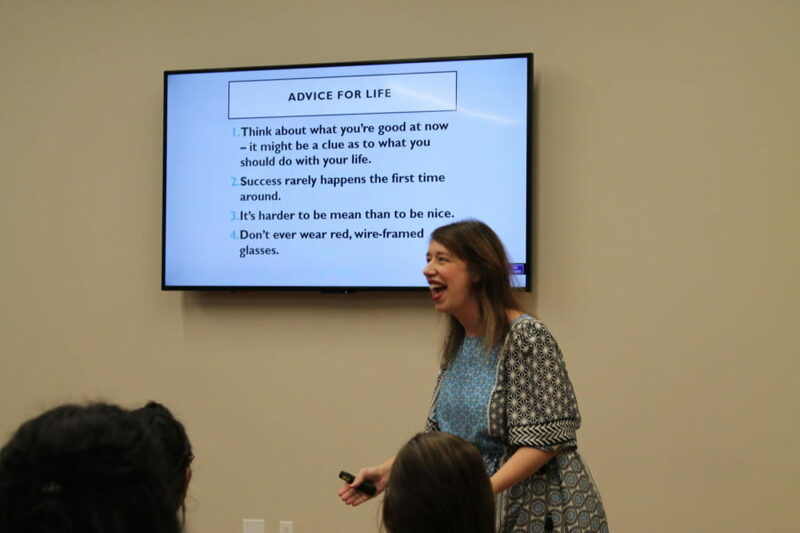 Author Jennifer Mathieu advises her audience to not wear red, wire-frame glasses based on her experience with her first author photo on Saturday night at the Cozby Library and Community Commons. Mathieu has been writing since she was a child and won a school-wide contest when she was in fifth grade. From telling her mother stories to write down for her as a child to becoming a published author of four books, author Jennifer Mathieu has come a long way. 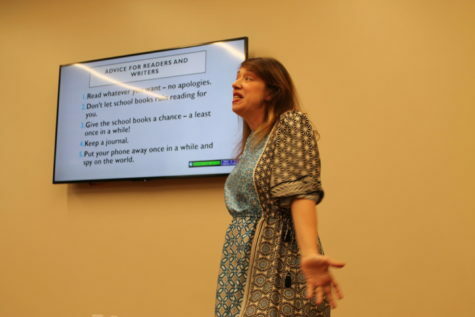 On Saturday, she made an appearance at the Cozby Library and Community Commons to speak about her writing history and her recent book Moxie, as well as offer tips for aspiring writers and answer readers’ questions. “[Author visits are] a great opportunity for people to see why authors write, and a little bit behind the scenes, and just how to be an author,” librarian Sarah Silverthorne said. 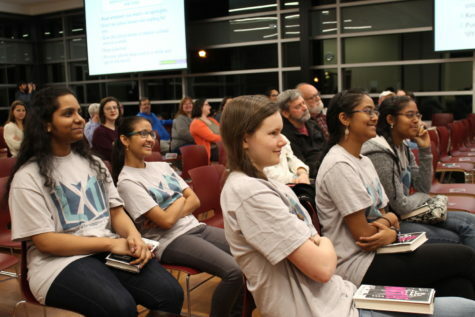 In addition to the Cozby Library staff, volunteer groups such as The Friends of the Library and the League of Extraordinary Teens also helped organize the event. The League of Extraordinary Teens listens in on author Jennifer Mathieu’s discussion on Saturday night at the Cozby Library and Community Commons. The League of Extraordinary Teens helped organize the event. Mathieu’s presentation began with an overview of her previous books – The Truth about Alice, Devoted and Afterward – which are all young adult novels. Mathieu kept the evening humorous by sharing funny stories regarding her writing career. For example, she recounted a time when The Truth about Alice was being sold at Costco in Mexico, and if someone bought the book, they would receive a free hot dog and soda as well. This story, along with others, left the audience roaring with laughter. Mathieu has always known she wanted to be a writer, and would think of many stories as a child. When she was in fifth grade, her school held a book fair, for which each student would have to write a short book; the winner would have his/her book placed in the school library. In high school, Mathieu edited her school newspaper, was an avid reader, and kept a journal, which she still has. Despite the fact she was a good student, she was not very happy during this time in her life. However, her love for writing helped her through her struggles. “When I look back at my high school years, they were really rough,” Mathieu said. “In hindsight, I was actually really depressed. I had a lot of anxiety issues…[and] put a lot of pressure on myself. The way I made it through was that I found an outlet and it was writing,” Mathieu said. After telling the audience her history with writing, Mathieu moved on to speaking specifically about her latest release, Moxie. 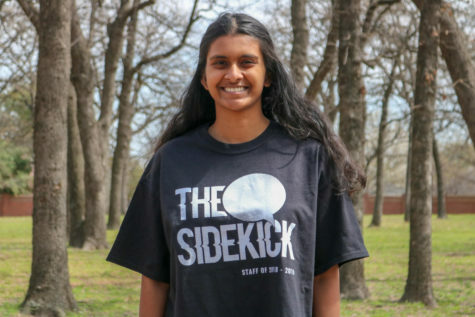 Moxie is a young adult novel and revolves around a teenage girl who starts a feminist revolution in her small Texas high school. Mathieu’s powerful statement about feminism had both men and women in the audience nodding in agreement. Author Jennifer Mathieu gives her audience advice for reading and writing on Saturday night at the Cozby Library and Community Commons. 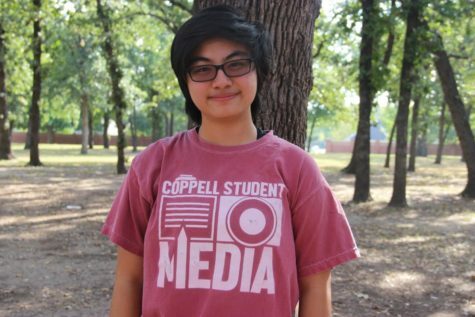 Mathieu was honest about her life experiences, especially her anxieties during high school. The event concluded with Mathieu opening the floor to questions. The crowd was filled with a diversity, regarding both age and gender. Many shot their hands into the air eagerly. “At events like this, I really like to hear others’ questions and the author’s answers to them,” attendee Vin Merill said. After answering everyone’s questions, Mathieu invited readers to approach her and have their books signed. However, the most valuable thing fans took home last night was not the signed book clutched in their hands, but the knowledge and inspiration that came with speaking to a successful author. 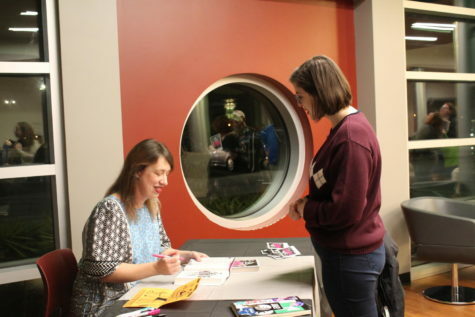 Author Jennifer Mathieu signs Allison Messimer’s book on Saturday night at the Cozby Library and Community Commons. Mathieu signed copies of Moxie after her discussion and question and answer session.